Every word children hear helps them learn, comunicate and take part in what’s going on around them. With the right hearing aid devices, properly fit, your child won’t miss out on a thing. ReSound Up Smart™ ensures constant and consistent audibility of speech at safe and comfortable levels. Clear sound amplified to the right level for your child – from an attractive, kid-friendly hearing aid device. ReSound Up Smart™ keep up with changing hearing needs as your child grows. Your child’s hearing aid devices meet or exceed all pediatric safety requirements – and they’re shielded from moisture, oil and debris, inside and out with Isolate™ nanotech protection. Shields every component, inside and out, from moisture, oil and debris for durability. Exceeds pediatric standards for tamper-resistant protection. Keeps hearing aid devices securely on children’s ears. 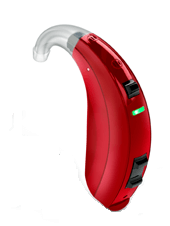 Lets you know the hearing aid devices are working and whether the battery needs changing.